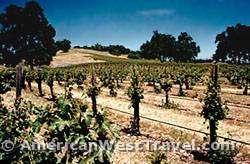 The San Luis Obispo County Wine Country Section of the California Central Coast Travel Guide describes the county's vineyards and wineries including the types of wine grapes grown, scenic routes through wine country, and where to go for tasting. The Paso Robles Wine Country in the inland north county features lovely country roads and hearty red wines. 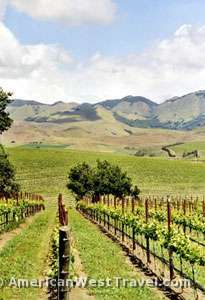 The southern San Luis Obispo Wine Country around coastal Edna Valley and Arroyo Grande generally feature white wines. The region's environment is conducive to the production of superior white wines, such as Chardonnay. In recent years other outstanding varietals have been successfully produced, including Pinot Noir, Syrah, Grenache, and white Rhone varieties such as Roussanne and Viognier. 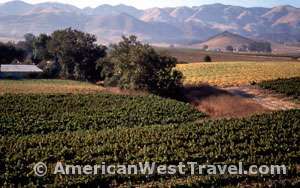 The Arroyo Grande vineyards are farther inland with less maritime influence. Here outstanding Zinfandels are produced. Grapes have been grown and wines produced here for nearly 200 years, starting with the early Franciscan Missionaries. Modern commercial winemaking started in the late 1960s. One of the earliest and most successful wineries is Edna Valley Vineyards. Today the valley hosts a blend of wineries and vineyards, ranching from large corporate establishments to one-person shops. Many have tasting rooms which are open daily. Most are located along a network on two-lane country roads with lovely scenery and a mountain backdrop. Edna Valley Vineyards. One of the earliest wineries in the area, Edna Valley always offers first-rate wines, particularly its Chardonnays. Located on Biddle Ranch Road, the very pretty tasting room and gift shop allows you to sip wine while looking out picture windows at a spectacular vista: a valley full of grape vines with a mountain backdrop. Saucelito Canyon Vineyard. The Greenough family purchased the Ditmas Ranch in 1974 and rescusitated its century-old Zinfandel vines. Outstanding, premium Zinfandels are now the focus of this winery. The new tasting room is across the street from Edna Valley. The Greenoughs are also noted for their hospitality. This writer and his family once enjoyed a private barrel tasting and tour at their vineyard in the hills of Arroyo Grande. Tip: Let your Saucelito Canyon Zinfandel sit for six months or more before opening. The results are great. Kelsey-See Canyon Vineyard. A fairly new winery, Kelsey-See Canyon's rustic tasting room is located in beautiful See Canyon in the midst of its renowned fruit orchards. Noted winemaker, Harold Osborne, can be counted on to produce a great Chardonnay every year as well as a fine selection of red wines. We also enjoy Dolores Kelsey's exceptional hospitality, as well as the peacocks running through the apple trees next to the tasting room. Claiborne and Churchill. This small family winery gets excellent results in several white wine varietals: Dry Riesling, Dry Gewurztraminer, Muscat, and Chardonnay. We particularly like their Riesling and Gewurztraminer. They also produce Pinot Noir, and recently we purchased an interesting Grenache. Located on Ca-227, their unusual tasting room is built out of bales of straw, a technique which is effective insulation as well as environmentally friendly. Paso Robles Wine Country surrounds the city of Paso Robles in northern San Luis Obispo County. The north county region lies inland, east of the coastal mountains which substantially limit the maritime influence: cool air works into the valleys only during the evenings. The environment is therefore quite different than the south county, with very warm and dry summers featuring warm fog-free days but cool nights. Winters are chilly with some freezing weather. The result is that the varietals grown here are quite different from the south county as well. With a greater day-to-night temperature swing than any other California wine-growing region, distinct micro-climates, diverse soils and a long growing season, the Paso Robles are has outstanding conditions for producing premium and ultra premium wines. The hills and valleys west of Paso Robles ("Westside Paso Robles") have gorgeous scenery and exceptional growing conditions. The most remote and western wineries of this area, many of them small family wineries, are collectively known as the Far Out Wineries of Paso Robles, and they produce extraordinary red wines. There are about 26,000 acres of wine grapes currently under cultivation in Paso Robles Wine Country. The number of vineyards/wineries has grown in recent years from 50 to about 100. Newcomers range from family and boutique wineries to international winemakers. Many have come because of the growing reputation of Westside Paso Robles. Red-wine grapes account for about 75% of the total grown. By far, the most common planted variety is Cabernet Sauvignon. Other widely planted varietals include Merlot, Syrah, Chardonnay, Zinfandel, Petite Sirah and Sauvignon Blanc. Like the south county, Rhone varietals have become quite popular - and successfully grown - in recent years, including Syrah, Viognier and Rousanne. 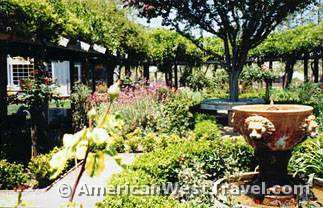 Numerous great events are held in Paso Robles Wine Country each year. 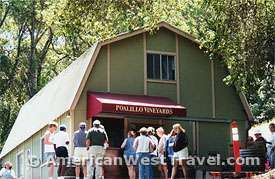 The most notable is the Paso Robles Wine Festival, held every May. Most of the area wineries set up booths in the downtown park for tasting. There is also food and entertainment. Many of the wineries will also stage their own events during the weekend, including winemaker dinners and open houses. Adelaida Cellars. A beautiful mountain-top tasting room, among hillsides of grapevines and nut trees. The winery specializes in estate-grown Pinot Noir, old vine Zinfandel and serious Cabernet Sauvignon. Excellent late-harvest wines. A beautiful place, and the wines are always first-rate. Carmody McKnight Estate Wines. Low-keyed tasting room is in a 141-year old converted farmhouse with a pretty lily pond out back. Their specialty is the often award-winning Meritage Cadenza blend (Cabernet Franc, Cabernet Sauvignon, and Merlot). Owned by the Conway family, the hospitality here is always first-rate, especially from daughter, Kathleen Conway. Dunning Vineyard. Intimate family winery on an early 20th century farm in a remote corner of the west side. Their excellent estate (home-grown) wines include Cabernet Sauvignon, Merlot, Zinfandel, Syrah, and Chardonnay. The Cabernet was outstanding. Also, family has converted 100-year old farmhouse into a bed and breakfast. Very beautiful place. Justin Vineyards and Winery. The most remote winery on the west side, and also the most opulent, Justin features beautiful gardens and tasting room, a small country inn and restaurant, a wine and cheese bar, and lots of wines. Its Isoceles blend (Merlot, Cabernet Franc, and Cabernet Sauvignon) is legendary. Caters to folks who like the finer things in life. Le Cuvier. The winery of legendary Paso Robles winemaker, John Munch, Le Cuvier's wines can be counted on to be unique, quirky, and unlike anything else in the area. Le Cuvier was easily the most interesting wine experience in Paso Robles. Meridian Vineyards. A large winery located on the east side of Paso Robles, Meridian wines can be found in many supermarkets, very inexpensive, and always reliably good. They have an outstanding annual 4th of July celebration with barbeque, fireworks, and entertainment. Always a sellout, tickets must be purchased well in advance. Nadeau Family Vintners. A micro-winery owned by Robert and Patrice Nadeau whose specialty is huge, mountain grown, old-vine Zinfandels. Also, a tiny amount of Rhone varietals. Expect good conversation and hospitality in their tasting room. Tobin James Cellars. Located on the east side, Tobin James' popular "Old West" tasting room often contends for "Best of Paso Robles". The wines are first-rate, too, especially their famous "Ballistic" Zinfandel and their "Liquid Love" dessert (late harvest) Zinfandel. Villicana Winery. The family winery of Alex and Monica Villicana produces tiny and often medal-winning vintages of estate Cabernet Sauvignon, Merlot, and Zinfandel which sell out fast. Windward Vinyard. Tiny family winery which produces only Burgundian styled, estate Pinot Noir, an uncommon variety for Paso Robles. A tasting session entails several different years' vintages from the same vines. It is utttering fascinating to note the year to year differences in taste.